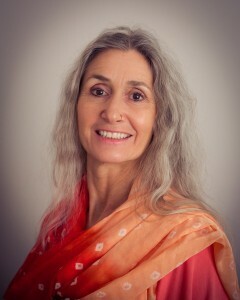 Marianne teaches at Seven Winds Yoga and Jyotish, which she founded in 2000. She leads retreats and workshops, and teaches philosophy for various teacher-training courses. A spiritual counsellor and Vedic astrologer, she assists others in understanding the unique karmic forces active in their lives and channeling that power to realise their highest potential, both on and off the mat. She trained for years in the Ashtanga, Iyengar and Sivananda traditions. Her practice and teaching have evolved with these influences into a practice she calls Shakti Rasa, her own fluid approach that incorporates breath and meditation into powerful asana work. Her classes also include pranayama, chanting, and meditation. She studied in India with Sri K. Pattabhi Jois, V. Venkatesh, Vinay Kumar, Yogi Manmoyanand and BNS Iyengar, and also trained with the last disciple of Krishnamacharya, Srivatsa Ramaswami. She is Yoga Alliance certified at the highest level: E- RYT-500 and is also a Yoga Alliance certified continuing education provider: YACEP. Marianne’s practice began nearly 50 years ago in San Francisco, where she was born and where she began meditating with Maharishi Mahesh Yogi. She studied Eastern philosophy at the University of California, Berkeley. Initially, yoga was for her an entirely spiritual practice, though her background in dance led soon to asana too. In the UK, she studied Buddhist psychotherapy, and qualified with an Advanced Certificate. With eminent yoga scholar, Georg Feuerstein, she completed over 1000 hours of certified course work in yoga philosophy and history. At the NW Institute of Vedic Sciences, she studied Vedic astrology, qualifying as Jyotish Kovid with the Council of Vedic Astrology. She has a BA and MA in English Literature from the University of California, and published a novel in 2008. In 2003, Marianne met her guru, Ramesh S. Balsekar, who accepted her as his disciple in 2005. Until his mahasamadhi in 2009, she travelled regularly to Bombay to the satsangs he gave from his flat. His teaching of Advaita Vedanta, so profound and at the same time so simple, transformed her. It informs her teaching, her practice and her personal life. A lifetime of seeking found its resolution at the feet of Ramesh, and she loves above all sharing that awakening– which points the way to ultimate peace and harmony– with others.